In this tutorial we will show you how to upgrade/downgrade your Hosting Plan in AMP (Account Management Panel). If you've outgrown or underutilized your current hosting plan, you can easily sign-in and take advantage of the AMP to upgrade, or downgrade your plan to match your current hosting needs. If you just want to change your plan term (payment cycle), for example from 1 year to 2 years, see our guide here. Using the Change Plan option in AMP, will allow you to do just that! Using the steps below I'll show you how to accomplish either an account upgrade or downgrade. So if you need to upgrade to a VPS or dedicated server, or change the limits of your business class shared hosting plan, you'll have the knowledge to accomplish this at anytime. Find the hosting plan you want to modify, then click the Change Hosting Plan button. For the Change to field, select the plan you are thinking about upgrading/downgrading to. For Select term, you can choose the appropriate billing cycle that works for you. 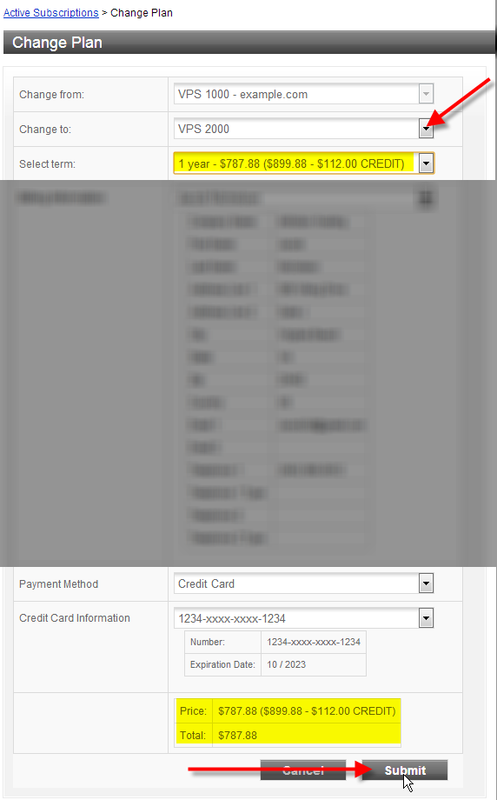 In this example you can see that I would have a $112.00 CREDIT from my current Change from plan of VPS 1000 when selecting my Change to plan of VPS 2000. You will see your total cost for the upgrade, or any credit you'd receive from a downgrade. Now that you've submitted your upgrade or downgrade request for your hosting plan, our systems administration team will take it from here and send you an email when the process is complete. The time frame for Upgrading/Downgrading will differ, depending on your request, but you will receive an email upon completion. If you are moving platforms from a shared account to a VPS or an inexpensive dedicated hosting package our systems administrators take care of the account move. How Much Does It Cost to Host More Domains? Currently I have a Reseller plan (R-1000S) but I would like to downgrade to a Business Plan (Pro) what would happen to the domains that I currently have congured, their websites and indivual DNS configurations? Hello and thanks for contacting us. You'll need to consolidate all websites into one cPanel account before its merged. Please contact our live support for further assistance. I am moving my webshop to Shopify, but still need to find a solution for my email server.Am I able to downgrade my VPS100 plan to launch or Power, and just just the inmotion servers to handle my emails while all website address request will go to my Shopify site ? Yes, you can downgrade your VPS to a Launch or Power plan to host just your domain's email, while your website would be hosted by Shopify. Typically this is done by configuring the DNS zone located in the name servers that the domain is pointed to. With that said, if your domain is pointed to InMotion Hosting's name servers, then you can edit the DNS records using the Zone Editor in cPanel. Specifically, you will modify the MX record, which handles the email (to InMotion), as well as the A record, which handles the website traffic (to Shopify) for your domain. You may refer to our guide "How to Set DNS Records for 3rd Party Services" for general instructions on how to host your website with a 3rd party while your email is hosted by InMotion Hosting. I strongly recommend reaching out to Shopify to confirm which records (and their values) are required for the services you have with them prior to making any changes to your DNS. If you are not pointed to InMotion Hosting's name servers then you will need to edit the DNS records (similarly as outlined above, but) using the system designed for the name servers that your domain is pointed to. I hope this helps! I would like to upgrade from Lunch plan to Power Plan, I would like to pay by Paypal. I'd suggest reaching out to Customer Service, and see if they can help you. You can do that by clicking "Support Chat" in the upper right corner of this page and selecting "Billing/Customer Service" from the dropdown menu. Hello, my plans have changed and I will not need all of the benefits of a VPS2000 solution any longer. I would like to save money and downgrade to VPS1000. My worry is about existing email clients that are configured to connect to vpsxxxx.inmotionghosting.com. Will the vpsxxxx host name change for me? Will I need to reconfigure these email clients ? Downgrading the VPS plan will not change your server ## number. You shouldn't have to change anything. Can Increase Stroage space SSD only in VPS (VPS-1000HA-S)? You can only increase drives space by upgrading to the next plan for VPS's. Otherwise, you would need to subscribe to a dedicated server plan. What about upgrading from Power Plan to R-1000S(reseller plan)? Yes, you should be able to upgrade from a Power Plan, to a Reseller hosting plan with the above steps. If you are having trouble, or not seeing the option I recommend contacting our Account & Billing team so they can help you upgrade your account. is there any downtime on the upgrade? about performance, is there going to be any improvements? There is no downtime on upgrade to a VPS. Resources are less divided on a VPS (as opposed to a shared server), so there may be a noticeable difference in performance during peak usage hours. The main advantage is that you have more control over the server - especially if you have applied to get root access. I purchased a WordPress hosting plan that could accommodate two sites. What my zealous little sales bot forgot to mention is I wouldn't get enough databases to install Wordpress on both sites. Got sent to this link by support. Hate getting suckered.. On my way to Yelp for a one star review. Thank you for contacting us. Even our lowest Business Class Hosting plan allows 2 databases, which will accommodate 2 WordPress websites. I checked in your account and can confirm that you are using both database slots for WordPress sites. It looks like both databases are being used for the same domain, which seems unnecessary. Feel free to contact Live Support if you need assistance identifying which database can be removed. This article refers to our hosting packages. I advise checking with Bigrock or GoDaddy for differences concerning how to use their products. I'm considering downgrading from VPS to reseller as I think that is all I really need. What happens to clients DNS settings at registrars? Thank you for contacting us. It depends how you are currently setup, but you may have some nameserver changes to make. But this should just result in normal propagation issues, which should not cause major issues. I recommend scheduling this type of move at an off-peak time, to avoid any major loss in traffic. What happens if I move from a VPS to a shared plan? Do you do the move? Thank you for contacting. This has to be handled on a case-by-case basis, since it depends on your specific setup. I recommend contacting Live Support, so they can provide information specific to your account. Long time customers like me: $539.88 with a credit of $168.10 = 371.78. I see your point,loyal customers do deserve something as well. Our customer service department would have more information on how the discounts work. I do know that some plans have a recurring discount on them for loyal customers such as yourself. These work out much better in the long run as they are 'forever discounts' and long time customers qualify for pretty decent discounts. The new VPS S-class do not currently have a discount as they are new, but likely will starting next year. Please feel free to contact our Live Billing team to see what the details are for your individual account. By credit do you mean store credit or returned credit amount. if store credit, How would i be able to use the store credit? Thank you for your question. When you perform an upgrade like the example above, it is crediting the money you already paid, and applying it toward your upgrade. If you have any specific questions about your account, Live Support would be happy to help. This is helpful. Where can I find information on which hosting plan is best for me? We have charts for each type of hosting so you can compare them and see which one is best for you. Can I add RAM memory to my dedicated server through AMP? Hello Jorge, and thanks for your comment. You can request additional RAM for your dedicated server in AMP, as also explained in our updated dedicated server specs article. You would just need to submit a verfied ticket so our system administration department can get in contact with you to plan the upgrade of RAM. Please let us know if you had any other questions! Doesnt' work. There is no "Change Hosting Plan"
The Change Hosting Plan icon is indeed there within AMP, although it could be in a different row depending on your specific plan and browser window size. Look through this section in AMP and you will certainly find it. I did this for my hosting plan, and it went very smoothly. I highly recommend it if you are over paying for your current plan.